Bastelmania: T stands for Too HoT yet again! I'm moaning again - it's still much too hot here for my taste, and I was really ill at the weekend because of it, so I'm hoping that sooner or later our climate will get back to normal. But I did notice more people up and about early this morning to get a walk in before it heats up too much. You can read more about it at our Tag Tuesday Blog. I counted about 20 people on my walk today - that's a record! And a visit to the shops -lots of crockery on show! Lovely bingo piece despite that you are not interesting in bingo! Sorry you are sweltering in the heat, maybe next year will be different. Enjoyed your window shopping today and your drinks look refreshing! Sounds like the morning is the best time for a walk right now. 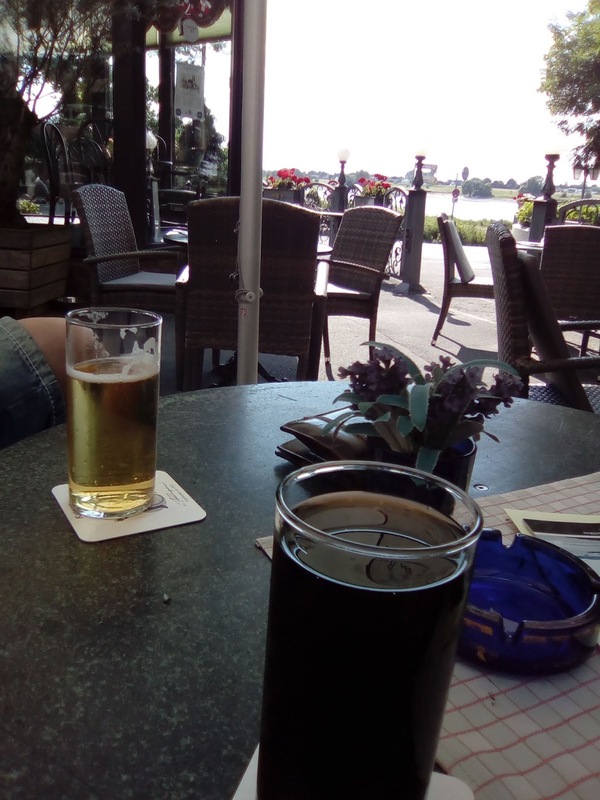 When it is too hot- it's best to get out when the weather is a little better. What beautiful sunrise photos. Gorgeous! What a glorious sunrise! And I love your bingo piece! Kudos. Stay cool. Hope you are feeling MUCH better. You Bingo tag made me smile. Alicedoesn't look too happy about playing Bingo in the heat. Our weather broke so for a day or two we have less humidity, but then it's back on the rise. Your sunrise photos are just gorgeous and H's Apfel Schorle sounds refreshing. The shop windows are just so pretty. I wish our stores took as much pride and care with their wares. Hope the weather breaks for you and you feel better soon. Wonderful fun Alice tag Valerie, this sounds an interesting new Tag Tuesday theme. I loved the sunrise photos and all the ones of the displays in the shop windows. The china looked lovely. I hope you are feeling a bit better today Valerie, its been much cooler here with some welcome rain. Happy T day wishes for tomorrow. I feel so bad that you have to suffer in this heat. I wish I could pipe some of my AC to you, so you could cool down a bit and get a decent night's sleep. I thought you did a wonderful job with your bingo tag. It is adorable and I am in awe. Your sunrise photos show how hot it is in your part of the world. The sunrise may be through your camera lens, but the heat still translates through those photos. I always love your shop windows you show. We have nothing this lovely here. In fact, I can't think of any shops that have such lovely displays. I love all those cups. They made my day. 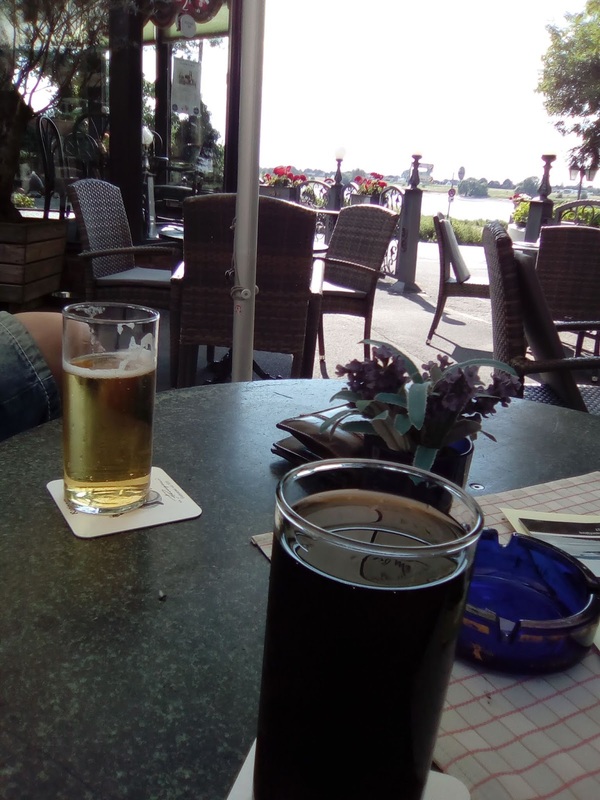 What a fun outing with H and the apple Schorle. I can't tell you how long it's been since I've seen an ashtray on a table, even one outdoors. Thanks for sharing your tag, your lovely photos, and your drinks with us for T this Tuesday. Sorry you haven't been feeling too well … hope you start feeling better soon. The heat has been ridiculous hasn't it. Here in the UK, we did have some rain over the weekend, but need more! I thought your tag was very good, and really enjoyed seeing all of your photographs. I make it 22 people on your walk!!! Wonderful Alice!!! I have never gotten into bingo either-but I really love your bingo piece! So sorry it is still so hot there-we finally got a break this past week. we still need rain though. Alice in Wonderland boards on Pinterest! I like your interpretation of the bingo challenge. What a lovely tea shop! And those are gorgeous sunrises! I am just a little bit jealous of both of these! Happy Tea Day! 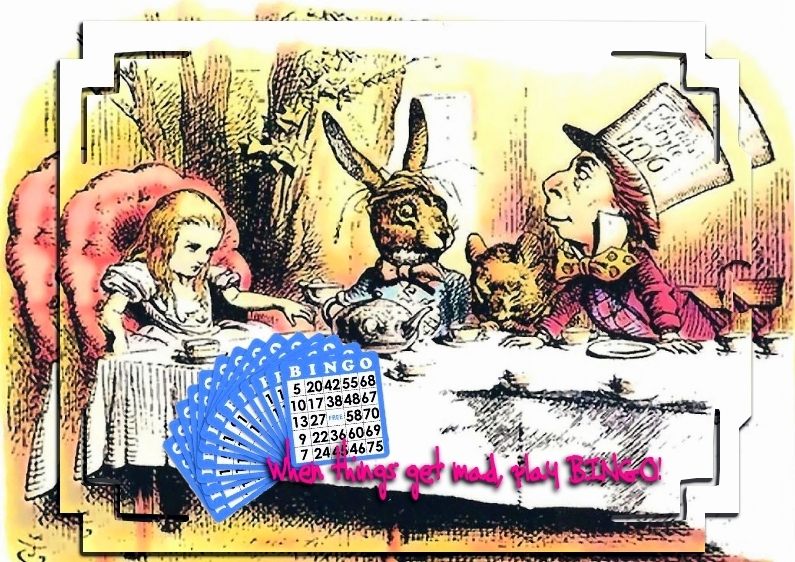 Oh so clever, Valerie - love the idea of Alice playing Bingo at the Mad Hatter's table - it would have been perfectly "normal" for them! The photos of your outdoor adventures are wonderful but sorry that the heat has been intolerable for you. I really love the happy summer shop window displays. I am loving your alice tag! And some really amazing photos today. I love the sunsets and all the window displays. So many wonderful sights from your walk. What a fab Alice tag Valerie, I must admit Bingo has never excited me either but I did giggle at that added sentiment hee hee!! Beautiful shop displays, loving those bright coloured mugs and cups. Hoping the weather breaks for you soon, we have had a weekend of rain and a drop in temperature which has been very welcomed. Hello Valerie, hope you get some cooler weather soon. Our temperatures have dropped by 10 degrees in the last few days so maybe the cool air will reach you too. What a tease showing us the shop windows, I would have loved to go in to each of these shops - the colourful china looks marvellous and I think I see a teddy bear who would have loved to come home with me. That's an "interesting" challenge theme - "Bingo". I do like Alice playing at the Mad Hatter's Tea Party. was für ein tolles alice tag,und deine shoppingtour war bestimmt schön,tolle sachen gibt es ja in euren läden. die bilder vom sonnenuntergang sind traumhaft, der rhein hat echt schöne ecken. ich wünsch dir noch ganz viel spass bei deinen spaziergängen,ich bin auch fast nur draußen,wir haben jetzt den balkon sauber gemacht,wir wollen dort wieder sitzen,besonders abends ist es sehr schön,wenn frische luft weht. ein paar pflanzen werde ich auch wieder machen,im winter ist alles kaputt gegangen. Thanks for all the photos. They all look so gorgeous. Hope you get nicer weather soon! You know I always admire the photos of your beautiful place, Valerie. I love Alice! And combined the bingo theme great! Kisses, my friend. The sunrise photos are wonderful! I can feel the heat through them. You do have a great place to walk. I'm particularly drawn towards those colorful mugs (beakers?) and am sure one might find its way home with me if I were to see them in a shop window. Happy T Tuesday! I’m sorry you suffered so much with the heat. It’s hot here too but it’s a dry heat and I don’t mind that so much. We don’t have air conditioning only ceiling fans. We keep all the blinds down of course, all the time. Your sunrise photos are spectacular! Such deep colors, as someone else has commented, very African. I suppose I wouldn’t be inspired by bingo either, but you did a good job with Alice and the mad hatter. Thank you for taking me window shopping. I loved it. I never think of photographing shop windows. So many pretty things. We have high humidity here. My flat has all rooms on the sunny side, so there is no place here to cool off. I keep the blinds closed all day, but I still have temperatures of over 30° inside, and this has been going on since May! Too much is too much! What a fun place to shop! Your sunrise photos are amazing! The Old Ferry looks like a wonderful place to sit and relax at. I think your Alice piece is charming and your sunrise photos are so gorgeous! 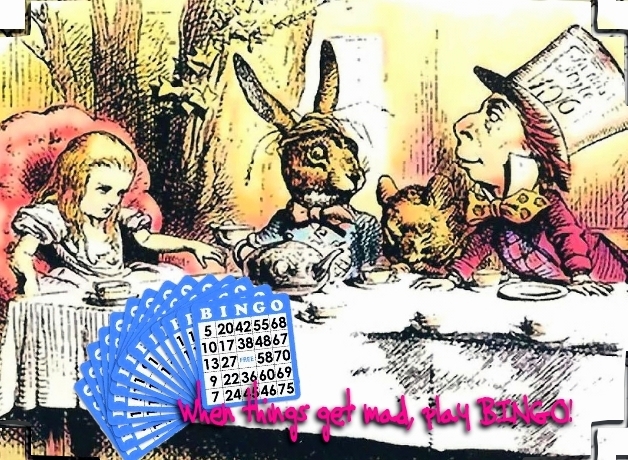 I really love your Alice tag and how you incorporated the Bingo theme!! Very creative!!!! A fabulous Alice tag and beautiful photos. Have a lovely day. For somebody who isn't inspired by BINGO, you sure came up with an inspired piece of artwork for it. Great job! Oooooh, and those sunrise pics. The vivid reds are amazing. I wonder what it is about sunrises, sunsets, moon shots, and photos of the sky, in general, that make them so captivating. I never tire of them, and they never fail to make me "feel" something... maybe a sense of awe?... in my chest. Kinda like listening to my favorite symphony or aria. Great photos, and I love your Alice page Valerie! Die Kombination von Alice und Bingo finde ich originell, den Spruch dazu auch. Deine Sonnenaufgänge sehen wieder spektakulär aus, so schön. Even your sunrises look hot! I do love your stationers' store and your Alice card really makes me smile. I hope you are feeling much better by now -- I'm late visiting! I am so sorry about the heat for you! I truly hope it cools down soon!!! I love your bingo art! So cute! LOL! Gorgeous sunrise pictures! I love the pictures of your shops! Beautiful items! Big Hugs! Just love your Bingo tag, it looks as if Alice isn't winning though. Your photos are fabulous, what a sky. I know how you feel about the heat, I'm useless when it's this hot, and my vertigo doesn't like it either. I am giggling all over this morning as this is the second blog post I read from someone sharing "Alice" and next week is my annual art retreat and our Theme is Alice! How fun! !